Nearly half of all American adults have had a closest family member incarnated at some point in their lives, according to a new study. Researchers also reported that one in seven adults has seen immediate family detained for over a year, with minorities most affected. The study of criminal non-commercial FWD.us and Cornell University investigated over 4,000 American adults. Over 2 million Americans are currently in prison in the United States. The report estimates that 64% of American adults have had someone in their family spend at least one night in prison or jail. 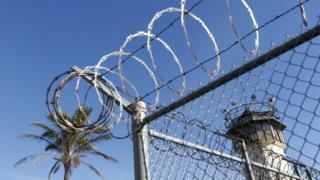 The study writer said it pointed to a nationwide “prison crisis”. “These numbers are amazing, the more if you do not like them, but as stories like mine,” said Felicity Rose, FWD director in a preface to the report. “One of the worst parts of grow up with a father in and out of prison was the isolation and shame I felt, “she added. One in five American adults has had a parent detained, according to the study, resulting in serious economic and emotional consequences. At the time of the survey, 6.5 million adults reported that an immediate family member was currently in prison or jail. One in seven adults has had a spouse detained; one in eight has a child locked and only one in four can ever visit a detained family member. There was no difference in prison rates along political lines, but researches na found that dyes were most negatively affected. African-American adults were 50% more likely than white Americans to have had a family member imprisoned and three times more likely to be detained in the family for 10 years or more, research found. Latino adults were 70% more likely than white Americans to have a baby captivated for over a year. And 54% of the detainees were the breadwins of their families. Incentive prices were highest in southern and western states, with residents who were 60% more likely to experience family attacks than people in the northeast. According to the prison policy initiative, the United States limits more people per capita than anywhere else in the world. FWD reports local prisons have taken over 10 million people each year in the past two decades. Despite the recent fall in prison sentences, the United States still occupies 710 people per 100,000. Britain’s prison rate is 147,100,000, according to FWD.